Feeling Cramped in your Urban Neighborhood? Create an Urban Oasis! You probably know that gardening is good for your health. With gardening, you can relieve stress and get a workout at the same time, all while improving your curb appeal. You probably also know how hard it is to make space for a garden in today’s urban environment. Go ahead and take a drive into older neighborhoods. You’ll see smaller houses on larger lot sizes. It’s a lot easier to plant a garden when you’ve got all that extra space. So how do you figure out landscaping on a small scale? This might seem obvious, but if you’re trying to create a stunning landscape scene, you’re going to need to know exactly where everything is going to go, and how much space you’re using for each element. The smaller space you’re fitting your design into, the more important your plan is. If your plants can do double duty, like small fruit trees that provide shade and give you food, you’ll find more value in using them. Pears, plums, figs, and pomegranates are great fruit trees to enhance your landscape. On the other hand, colorful vegetables like leaf lettuce, purple cabbage, peppers, and basil are perfect for color beds. Back to the planning; do your research so you’ll know what size your plants will grow to. You can ask your nursery professional to show you some dwarf versions of proven good plants. Plant breeders have been making dwarf plants that are shorter and smaller but keep their looks and strength. Compared to just a few years ago, there are scores of more choices available today. These small versions of traditional plants are perfect if you’re trying to build a landscape in a small place. If you’re trying to cram too much into your small space, you’ll just have a clutter. Less is often more when it comes to design. 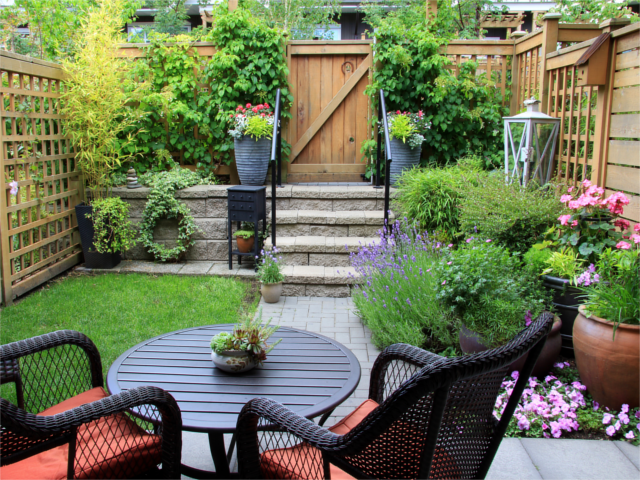 Likewise, less can be more when you’re designing a landscape, especially in a small space. Living in tight spaces can make you really look for privacy. Be careful about your choices. Taller shrubs are usually wider as well. Wide plants mean wasted space. If you’re thinking about vertical shrubs, there are not a lot to choose from. In addition to few choices, vertical shrubs often look restless as privacy plants. Most importantly, however, do not just choose a plant and put a bunch in a row like a wall; it will just look like a wall. Alternatives include plants, like dwarf southern magnolias such as Teddy Bear, or, if you have a bit more space, Little Gem magnolias are a great choice. Plant an odd number in a kind of row, but not a strict row. These will grow above your fence, without taking up all the ground space. Color beds are a great addition to your landscaping tool belt. However, they need to be kept under control. Going back to less is more, small bits of color will create more of an impact than a long section of a color. Because your landscape is small, it’s going to be viewed close-up, so just little pockets of color are going to work best. Your plants don’t have to be the only part of your landscape design. Paint your pots, put them on a pedestal, draw attention to them. No matter the plant you put in a decorative pot, the statement it makes will be stronger. Remember, however, that plants in pots or other containers are giving up some of their winter resilience because their root systems are more exposed. You’ll also have to feed and water them more because their soil reservoir is smaller. If you’re creative, you can bring a third dimension to your design with hanging baskets and wall hanging pots. Another "useless" spot is that long narrow area between your fence and wall. You could just plant grass there, but in this drought, that’s expensive and difficult to maintain. Instead, consider planting an herb garden. If you’re looking for someone to help with your landscape design problems, SQLA Inc. has years of experience, both commercial and residential. Visit the website, or call (562) 905-0800 to see what they can do for you. Do you have a tiny landscape you're proud of? Share it on the Facebook page!